There is much debate over yesterday’s controversy. THERE IS MUCH debate about the fate of Luis Suarez following his biting incident yesterday. The main point of contention seems to be whether Liverpool should sell or stick by their beleaguered star. “Those who call for Suarez to be thrown out of the game have succumbed to hysteria,” while adding that banning him for “seven or eight games would seem reasonable”. “Now Liverpool must wash their hands of him after yesterday’s events at Anfield. Meanwhile, writing in the Daily Telegraph, Henry Winter took a similar view to Howard. The Times’ chief football correspondent, Oliver Kay, said that Suarez’s actions went beyond his usual less-than-ethical behaviour. “There are a lot of sly, cunning footballers on planet football. There are very few others who have found themselves in the dock once for biting an opponent, let alone twice. In addition, there are contrasting reports on what the club made of the saga. The Guardian reported that he suggested “no player is irreplaceable,” and the Daily Mail claims the club are under pressure to sell Suarez, while reports today suggest the club will definitely stand by the striker and refrain from selling him. Finally, also in the Guardian, Dominic Fifield gave as vivid a summary of the event as any. Email “‘Liverpool must wash their hands of Suarez’ – How the media reacted to bitegate”. 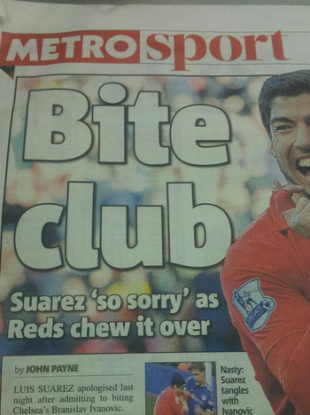 Feedback on “‘Liverpool must wash their hands of Suarez’ – How the media reacted to bitegate”.